The care for the sick and the concern for them and their family members, discovered by St. Camillus, form the core value of the Camillian mission and ministry. Our guide and rules of engagement are very simply and clearly set down for us in the parable of the Good Samaritan in Luke’s gospel, chapter 10. There are three protagonists within the parable: the brigands who attacked the traveller, the victim who was robbed and left for dead and the Samaritan who, in fact, is Christ himself. Jesus, in telling the parable, is at his storyteller’s best. In his account of what befell the misfortunate traveller, we know that the very same misfortune is the sad reality that can be found in every generation in human history. Only the details differ from one set of circumstances to the next and the “left for dead” experience is had by victims in our own day and right under our own noses in Ireland. Our magnificent advancement in science and technology has contributed greatly in preventing and curing pathologies but has not eliminated sickness, bereavement, muggings, wife beating, child abuse, isolation, fear among the elderly living alone and suicidal tendencies among young people who are sick of living. Sickness has many faces and presents under various guises. In fact the sick are all around us. While we have to say sickness is normal, however unfortunate. we are never prepared and the timing always seems wrong. Those are the people the World Day of the Sick calls on us to be aware of and become for them a Good Samaritan. We Camillians say you are never more than a hundred yards from a sick person! That was the discovery made by St. Camillus. It changed his life and the lives of the sick whom he touched. On February 13th next, the Feastday of Our Lady of Lourdes, the world Day of the Sick will be celebrated across the catholic world. Instituted by Pope Blessed John Paul II in 1992, this year it is celebrating its 21st birthday. The aim is to draw attention to the reality of sickness in our world, in our neighbourhood down the road and the stress and strain also on family members. It calls on us to be the Good Samaritan who stops, looks and remains in a caring way alongside our victim-sister/victim-brother notwithstanding our feelings of helplessness. Togetherness cuts through isolation and subsequent fear whether real or imaginary. It highlights the value of presence even in silence as our only basic statement when it comes to handling the mystery of pain and death among those around us. From our high-tech hospitals to the most primitive mission healthcare clinics, the call to be consciously aware of the sick will be the focus point by the Pope, Bishops, priests and catholic laity across the world. In it we see a personal challenge as we reflect on the parable of the Good Samaritan where some walked by on the other side while the stranger (the Samaritan man) stopped by and thanks to his compassion he found creative ways of caring, treated and saving the life of the victim whom he looked upon as his own brother. In saying “Do this in memory of me” at the end of the Last Supper when He had just instituted and celebrated the Eucharist, Jesus beckons us into much more than just celebrating Mass repeatedly. He had in mind his entire teaching in loving our neighbour and particularly, as he himself showed, loving in a very special way the weaker ones, the sick and those who are weighed down by the human condition of suffering and pain. The Christian care of the sick, following the example of Christ and taken up by St. Camillus, is always directed towards the sick person in the totality of his/her being. In a special way Jesus identified very personally with the leaper, the blind, the bereaved ... these are the people who sought Him out and were never disappointed. So central were they to Jesus in his ministry and mission, that He challenged us, his followers, with his clear-cut statement: “Whatever you do to these, the least of my brothers and sisters, you do it to me” (Matt 25;40). All of us Christians are called to be Christ-like (Samaritan-like) to the sick and those weighed down by life’s problems. 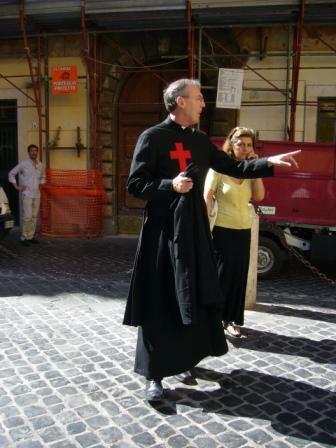 Camillians make that challenge their life commitment in over 40 countries following the example of the Founder, St. Camillus (1550-1614), who referred to the sick in the neighbourhood (apart from those in the hospitals and institutions) as “the wide ocean” of Camillian care and concern. Our Camillian Lay Family members have this as their aim and objective. The World Day of the Sick (Feb 13th) calls on us to stop and look with compassion on the sick all around us. That too is our prayer, compassionate in heart and hand, in response to the teaching of Jesus the Good Samaritan. 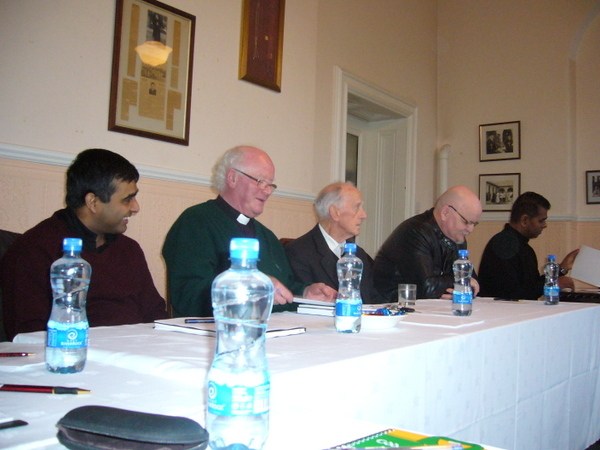 The Provincial Chapter was held earlier this year in Killucan. 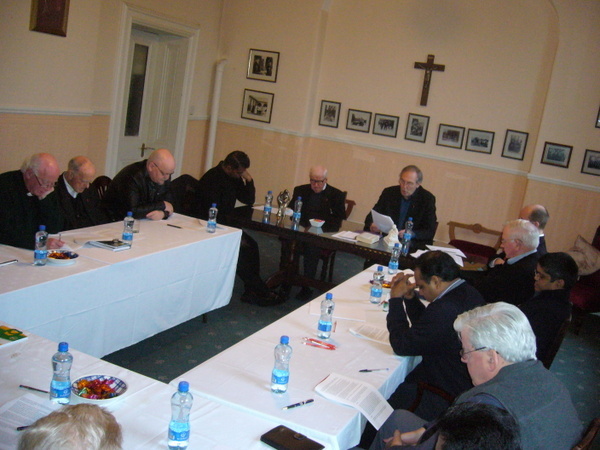 It was three busy days of reports and dialogue on the future direction of the Order in preparation for the General Chapter to be held in Rome at the beginning of May. A great deal of effort was put into every report and thanks to all involved. 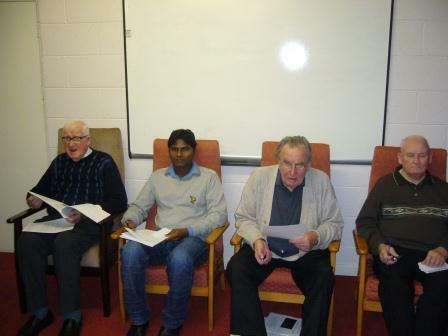 The Chapter had been preceded by our Local Chapter meetings which focussed on the Camillian Project and the proposed amendments to the Constitutions as welll as our Provincial Norms. 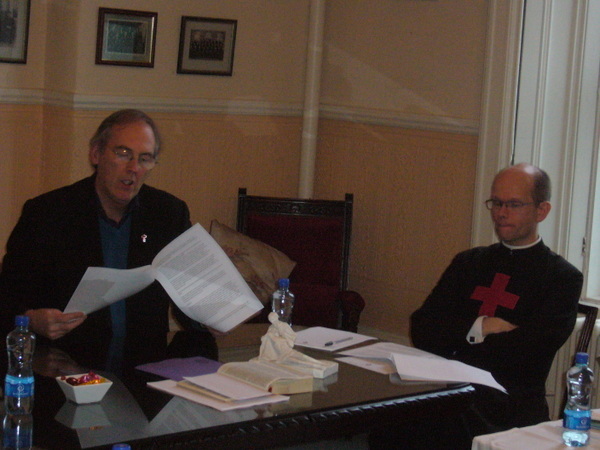 We also passed proposals to be submitted to the General Chapter. 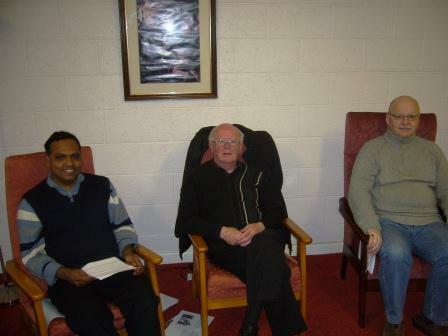 The Provincial & 1st Councillor, Fr Stephen & Bro. John. 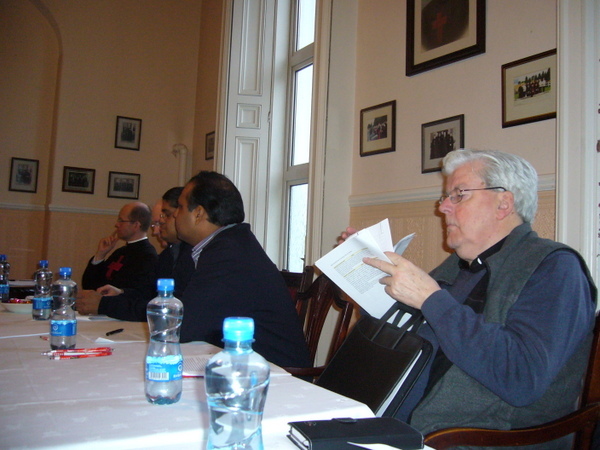 Indian & Anglo-Irish Camillians together. United in Mission. 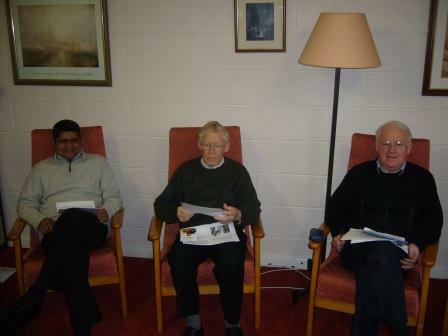 l to r. Frs Tomy, Martin, Bro. 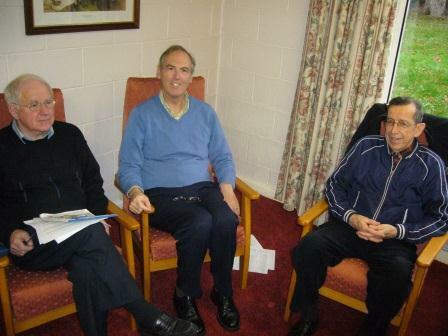 Gabriel, Frs Nik & Joseph. Fr Monks near to camera. 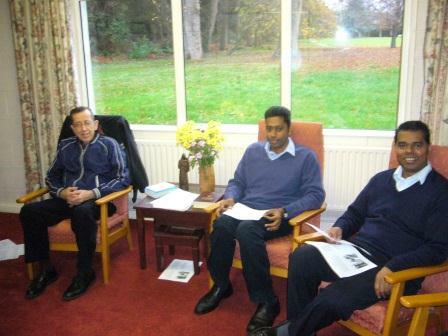 To his right, Frs Jayan, Vincent, Denis & Bro. John. Again I walk outside and think, ‘This guy’s not getting my money.’ Not the way to run a business I thought. Incidentally, I didn’t see the sign because I was looking at the sign on the wall. Speaking of harm it appears the author Marian Keyes wants a ‘National Stone a Priest Day’. She acknowledges that no matter how nice a priest is, how many raffles he runs, he is still a foot soldier for ‘a f*cked up misogynistic regime’. Now it’s not pleasant the idea of having stones pelted at oneself. How would Ms Keyes feel if this kind of violent language was directed at herself. It reminds me of George Seawright, the DUP Councillor, who called for all Catholic priests to be burned at the stake. These are sad and intolerable statements coming from people whose prejudice and intolerance is more important than courtesy and respect. Ivana Bacik is supposed to be a public representative in Seanad Eireann. Yet she alleges the Catholic Church's position on abortion is because the clergy are misogynistic and see women as innately deceitful. And this is the kind of langauage coming from public representatives who cannot get beyond their own prejudice and intolerance. We have a long way to go. Let’s appraise every institution and every statement, but let’s also acknowledge those purporting prejudicial and intolerant views should have their views named precisely for what they are. 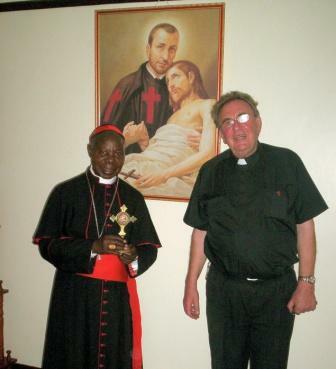 Fr Tom O'Connor with Cardinal Wamala. The recent scandal in the disappearance of four million Euro in Irish aid to Uganda saddened everyone. The government in Kampala and even the President himself reacted with well rehearsed outrage and some staff in the prime minister’s office was arrested. The Irish government’s reaction was to stop all aid to Uganda as the President there promised to find and pay back the lost funds. 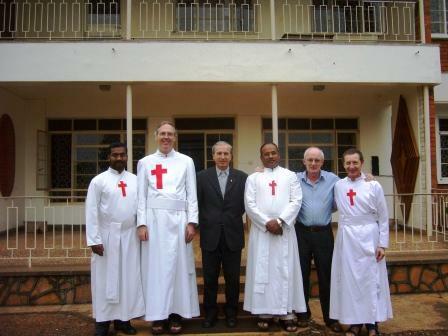 The disgust among the Irish taxpayers is matched only by the severe loss to the poor and the sick in Uganda. I find no joy in sharing my reaction: more of the same! Corruption is endemic in Uganda and the local expression out there says it all: ‘a fish rots first in the head’. So much so that some funding agencies in Ireland and elsewhere prefer to give aid directly to NGOs or to missionaries for specific projects (hospitals, care centres, schools, roads) in aid of the sick and the poor. Coming up as we are to the Holy Season, I love to recall the differences between here and there in the celebration of Christmas. First of all, very few people in Uganda have ever seen snow and I found it particularly difficult to explain or describe snow and more difficult still when it comes to hailstones. That rules out Santa and there is no tradition of Christmas cards and less still gift-giving among people hidebound in poverty and destitution. But one thing leaves an indelible memory: having a new born baby and it’s mother in a life-size crib during the midnight Mass in the hospital chapel. In Uganda when a baby is born before noon it is customary for mother and baby to return home that same day. That means to have a baby for the crib we have to have one born that afternoon or evening or night. While I was there we were always lucky though one year we had to avail of a Moslem mother and her baby. The young mother was quite happy to take part though she chose not to sit in the crib but in the front seat only feet away from her treasure. Year after year the impact of mother and baby in the crib was most impressive giving life and zest to the entire liturgy which included spontaneous clapping and ululating. Time and again during the two hour ceremony the baby would wake up and scream its cry at being born and needing a feed. Mothers, whether in Ireland, Bethlehem or Uganda know well how to answer that call and in Uganda a healthy breast feed, there and then, solved the problem for our darling in the crib whether the celebrant is at the moment of consecration or not. Indeed the crying gave further meaning to the crib as our baby joined Baby Jesus in what babies do best. My own thought might have been that I was in the presence of a Ugandan Camillian in the making! After all, whoever we are and whether in Ireland or Uganda, all vocations begin somehow with a similar baby cry in the mystery deep in the hearts of you and me.